BillHustonBlog: Quorum? 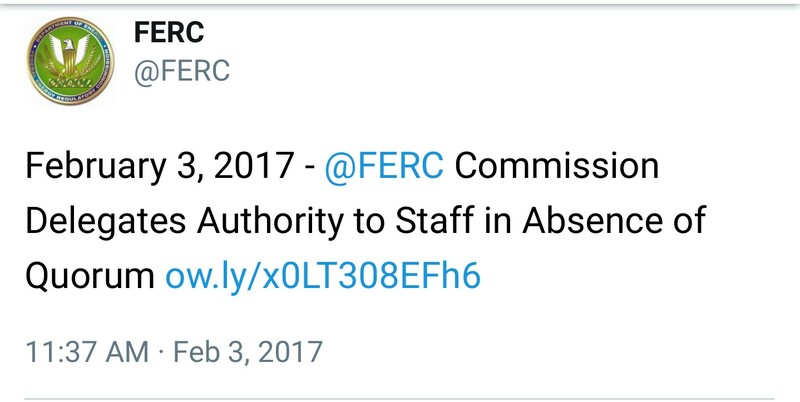 FERC don need no stinking Quorum! Quorum? 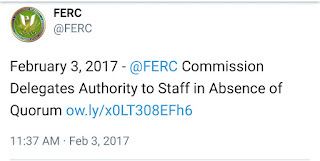 FERC don need no stinking Quorum! The Federal Energy Regulatory Commission (FERC) today issued an order delegating additional authority to agency staff to continue certain agency operations in the absence of a quorum of Commissioners. The delegation order also affirms that all pre-existing delegations of authority by the Commission to its staff continue to be effective. The delegation order takes effect Feb. 4, 2017, and the additional authority granted to agency staff will last until the Commission again has a quorum and moves to lift the delegation order. The delegation period will not extend beyond 14 days following the date a quorum is re-established. The Commission anticipates not having a quorum for an indeterminate period, but has a continuing responsibility to carry out its regulatory obligations under the Federal Power Act (FPA), Natural Gas Act (NGA), and Interstate Commerce Act (ICA), among other statutes. When regulated entities make rate filings under the FPA or NGA that, in the absence of Commission action, would take effect without suspension, refund protection or the ability for protesting parties to appeal, the Commission's general practice has been not to allow that to happen. By issuing the order today, the Commission intends that to ensure that FERC staff has authority to prevent such filings from taking effect by operation of law during the no-quorum period. Rate and other filings: The Director of the Office of Energy Market Regulation (OEMR) can accept and suspend rate filings, and make them effective subject to refund and further order of the Commission, or accept and suspend them, make them effective subject to refund, and set them for hearing and settlement judge procedures. For initial rates or rate decreases submitted under section 205 of the FPA, for which suspension and refund protection are unavailable, FERC staff is granted authority under section 206 to institute proceedings in order to protect the interests of customers. Extensions of time: FERC staff can extend the time for action on matters where it is permitted by statute. Waiver requests: The Director of OEMR can take appropriate action on uncontested filings under the NGA, FPA and ICA, seeking waivers of the terms and conditions of tariffs, rate schedules and service agreements, including waivers related to capacity release and capacity market rules. Uncontested settlements: The Director of OEMR has authority to accept settlements not contested by any party or participant, including Commission trial staff.